...if you had a world class expert in managing your mind and body take you by the hand and mentor you? Let's be honest and make a significant change. Each day of your life could be more passionate and purposeful and less angry and stressful - and you know it. It's not like you're failing. You've achieved some great things. But sometimes you get in your own way. And you know there's more for you in life. You know you could show up better in your relationships. You know you could be calmer, less angry. You're just not sure HOW to learn those skills. You're busy. You get distracted. You feel frustrated and stuck. But you've waited long enough to figure things out. You can feel it - your loved ones need you to show up now. It's time that you learned new strategies for reaching into your heart and mind and accessing new levels of happiness and higher performance. It's time to get world-class expertise on how to master your self and your relationships - quickly. Today, the frustration can end and you can make a decision that transforms your life forever. What would happen if you had immediate access to the guy who has trained high net worth executives (some worth $500 million)? The guy who advised Pixar on the Award-winning movie Inside Out? The guy who wrote an award-winning book? What if he started advising YOU? What would happen if he gave you the same strategies for mastering the mind and body so you could reach the next level as many of the world's most happiest and highest-achieving people? Isn't it time you had access to the secrets and proven strategies being used by the top performers in every area of life? You don't have to guess how to reach the next level in life. You've worked hard enough. You've struggled long enough. You can reach high performance FASTER than you ever imagined. You can attain happy relationships. You can achieve inner satisfaction. You can turn down the volume on anger while learning to be more successful in life. High performance means succeeding more than the average person over time. It feels like you are living an extraordinary life that's beyond your dreams. Who knew you could be happy and satisfied with life?! High performance living feels like you are fully alive and engaged in the moment again. You feel your purpose. You generate joy, confidence and love whenever you want to. You finally experience the relationships you've always wanted. High performance feels like the best days of your life are now the typical day. When every day is passionate, fulfilling, and meaningful. It's a whole other level of living. And it can be yours if you decide you want it right now. Dr. John's Ultimate Anger Management Course is the path to experiencing that next level of life. It is so much more than anger management. It is stress reduction. It is the cultivation of positive emotions like happiness. It is relationship skill building. It is mastery of mind and body. You'll learn how to master your psychology, physiology, productivity, and people skills so that you can feel alive again, find your purpose, and feel more joyous, confident and fulfilled in every area of your life. You don't have to struggle so much to balance your life. You don't have to keep fighting uphill battles or let your fears win. There are better ways to handle life and this is HOW. It's time to access another level of being and achieving in life. It's time to hit high performance. You can make that happen TODAY by joining Dr. John's Ultimate Anger Management Course. This is an advanced online training and personal development coaching program taught entirely by Dr. John Schinnerer, the leading coach of mind-body mastery and the high performance coach. The program is an advanced 10-week comprehensive online personal development training program that you can take at your own pace. The program also includes downloadable exercises, advanced tools and resources to help you reach high performance in every area of your life. Finally - proven strategies to master your mind, your emotions, your career, and your relationships. This isn't a hype-up session or therapy session. This is about giving you proven practical skills...about giving you REAL tools, mindsets, and habits to make lasting change - starting NOW. This is science-backed, heart-centered strategies and tools for excelling in life. Dr. John's goal is to help you rid your life of anger, fear, fatigue and stress so that you can live a more joyous, creative, loving, and remarkable life. Dr. John teaches the entire course to you personally, leveraging the latest breakthroughs in psychology, neuroscience and world-class performance studies. “Thank you for making this course available to everyone. I am a 48 year old husband and the father of 2 wonderful young adults. I have always been interested in personal development but, this course takes the ideas and principles from the abstract rhetoric that most write about and provides daily realistic actions that improve the quality of, not only my life, but the lives of those around me. I have learned a great deal about myself and can identify the anger in the moment. Now that I can identify it more quickly it is much easier to deal with." – Steve H.
“Your book and course have changed my life! I learned that I did not have so much of anger issue, I had a positivity issue! I only saw the negative in my life, and I put that load on the ones I love most. The images of the buckets of positive and negative thoughts will always be in my mind. Thank you for your course and keep up the great work!" – Justin A. “Let me take a moment to express my gratitude to you for your outstanding work. Your kindness has been helpful in many ways, but specifically in giving me a few new tools to use in my daily life. I took your online anger class… and learned fantastic anger management tricks as well as ways to a more mindful way of life when anger slips in. Your book, How Can I Be Happy, is even more helpful! Thank you! Be well." – Bill C.
“One of the best mentors for the game of life….I can’t give any higher praise of Dr. John Schinnerer. The stuff which he teaches can and will change your attitude and your life. Happiness as he states is generally too broad, and often misused but the tools he teaches to increase your satisfaction with life actually work." – James R.
“I was stuck in a job I hated when I first started my coaching with Dr. John. Now I’m in a position that I am passionate about! I love getting up in the morning. I love going to work. Thank you so much. My life has been transformed.” – Jody C.
"My fiancee and I recently broke up. Before that, I was angry all the time because she wasn’t doing anything right. It didn’t take much to set me off. However, due to your course, I’m not stressed nearly as much. I’m calm much of the time. I’m less angry. And since I started reading your book, I now have more patience. I’m also much happier! Thank you!" – Chris P.
“The more I am moving ahead with your course the more I am astonished with the depth of your work. It is helpful for me both personally and professionally. Thank you." – Dr. Shaheen. "I have to say your course was excellent. I learned a lot, and within the first 3-4 lessons, I felt a difference in my life. I now feel an inner peace and calm. I do get miffed, but I “let it go”. I would say my anger level rides about a 3 out of 10, if that now. This course has helped SO much. THANK YOU! Again I thank you for your generosity… you are a blessing. I HIGHLY RECOMMEND IT to anyone who asks. You changed my life. GOD BLESS…. thank you from my heart." – Vicki B. Have you ever had someone like this take you by the hand and show you the path to a higher level of excellence and fulfillment in life? Well, now Dr. John is coaching YOU for an entire 10 weeks! He's ready to help with his best tools. The power is in your hands. Register today and Get this Ultimate Training Right Now! When you register for the Ultimate Training, you receive the same training and tools Dr. John would give his elite-level clients, from every day people in transition striving for a better life, NCAA athletes, multi-millionaire entrepreneurs, and high net worth executives. THE CORE PROGRAM: 10-weeks of advanced, mastery-level online personal development training (Value $1,750). Action step 1 – What’s the DIF? Action step 2 – Mindfulness with MP3 audio file and MP4 video file. Lesson 2 – When is anger valid? 1. When is your anger valid? Action step 2 – Self-compassion vs. self-esteem. Includes downloadable MP3 file. 2. What makes up an assertive conversation? 3. How do you approach an assertive conversation? 4. What do most people do in tense conversations? Lesson 6 – Emotional Mastery – It’s Not Just About Anger! Action step 2 – ABCDE method to challenge negative thoughts downloadable PDF. Action step 2 – Finding positive meaning in past traumas (Post-traumatic growth) downloadable PDF file. Action step 2 – Your Best Possible Self exercise downloadable PDF. 3. What are the positive emotions? Action step 2 – Building compassionate image with downloadable PDF. Action step 2 – Portfolio of positive emotions with downloadable PDF. Your very own personalized Certificate of Completion is available to you instantly upon completing the course. This anger management class is guaranteed to be court-approved or your money will be refunded. This powerful anger management class uses the latest evidence-based, scientifically-proven practices to help you manage anger. This course is personally designed and recorded by emotion expert, Dr. John Schinnerer, a Fellow of the National Anger Management Association, Ph.D. from U.C. Berkeley, consultant to Pixar’s Inside Out and award-winning author. It is fun, informative and life-changing! The anger management class is taught by videos (hosted on private YouTube pages) to deliver content directly to you in the privacy of your own home. These video files are downloadable to your computer. You may keep them as long as you like. They come in a variety of file formats including MP3 and MP4. All exercises are downloadable in PDF, MP3 and MP4 formats. These files are viewable via PC or Mac computers. They will not work with Linux. Get Advanced Bonus Training FREE When You Register Today! BONUS #1: Expert Interview with Dr. Daniel Amen, author of Change Your Brain, Change Your Life, ground-breaking psychiatrist researching SPECT brain scans and how the brain works at peak capacity. BONUS #2: Presentation by Dr. John Schinnerer, speaking on the Power of Mindset - the Mindset Necessary for Success, Happiness and Long Life. What is the difference between the 10 Hour, 12 Hour and 15 Hour Classes? The 15 Hour Anger Management class is the Platinum version containing all the best exercises and bonus expert interviews. The 12 Hour Anger Management class is the Gold version and has two less bonus expert interviews and 2 less exercises. 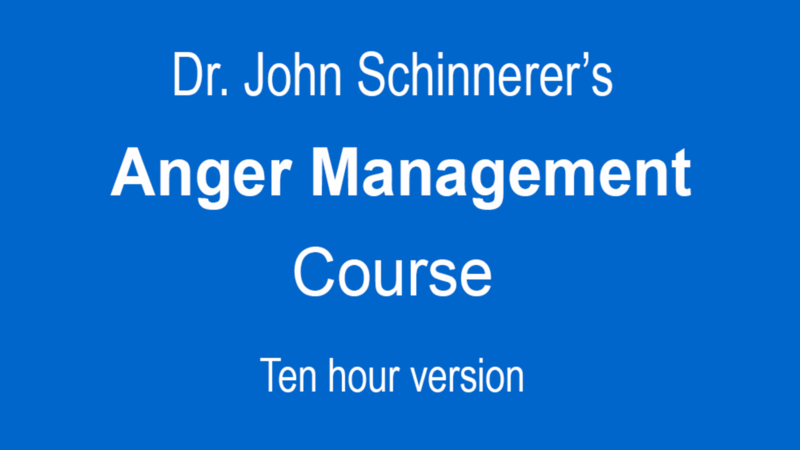 The 10 Hour Anger Management class is the Silver version and has three less bonus expert interviews and 4 less exercises and audio files. .... And you can have it right now for just 1 payment of $147 or 3 monthly payments of $52. Please note: This is a ONE-TIME only offer. This bonus stack will not be repeated again. If you don't signup, you'll never get this level of value again. Please do not miss it. You've probably never experienced an advanced course like this. That's why we want to make it easy for you to join. We'll give you 30-days to experience the course. If this is not the BEST personal and professional development program you've ever been through, ask for your money back and receive a complete no hassle refund. Don't wait to transform your life. Your dreams, your family, your spirit and community need you performing at your highest level of potential. Signup now! Enroll today by clicking your payment preference above. You can choose to pay one payment of $147 or three monthly payments of $52 (one payment per month for three months). If you are not happy with ANY part of the program for ANY reason, just tell us within 30-days and you'll receive a full refund - no problem, no hassles, no risk, no worries. You can take the courses at your own pace and you have access for LIFE. But the offer ends soon so sign up now!